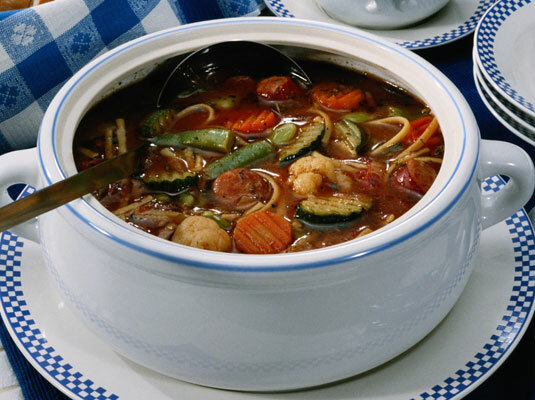 This simple vegetable soup has the flavor and aroma of newly picked vegetables and herbs. You add texture to this soup with a crunchy bread and Parmesan topping. You also can add more of your favorite vegetables to the mix, such as carrots, cauliflower, or fresh green beans. Cut the zucchini in half lengthwise and slice it into thin strips. Core and dice the tomatoes. Heat the oil in a medium-sized pot, then add the onion, zucchini, mushrooms, and tomatoes. Sauté over high heat 10 minutes or until the vegetables are tender and the tomatoes are pulpy. Add the vegetable juice and chicken broth, then simmer 2 minutes or until hot. Stir the basil into the pot and simmer 2 minutes. Place the bread on a cookie sheet and sprinkle with Parmesan. Place the cookie sheet under the broiler, 3 inches from the heat, and broil for 20 seconds or until the cheese browns lightly. Pour the soup into four bowls and cover each serving with a cheese-topped bread slice. Per serving: Calories 257 (From fat 94); Fat 10g (Saturated 2g); Cholesterol 4mg; Sodium 1,111mg; Carbohydrate 34g (Dietary fiber 5g); Protein 10g.